BUGSLIDE is the X-treme waterless cleaner and polisher in one. The most popular because you always have it handy! Most economical. 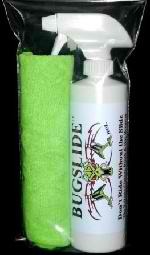 Half gallon of Bug slide for $68 domestic shipping is free. ​Save money on the large 64 oz. refill bottle. Refill your 16 oz. or 4 oz. travel bottles. No need to ever run out. Same superior formula, just in a convenient 16 oz spray bottle. Excellent for deep cleaning and polishing all of your vehicles. Simply spray a small amount onto a micro-fiber cloth and wipe over the surface to be cleaned, then buff to a beautiful shine. BUGSLIDE may be sprayed directly on the vehicle, especially when removing hard bug residue. 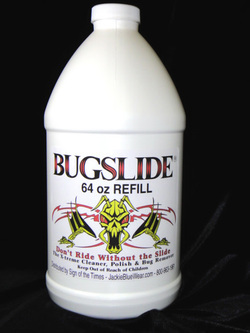 When removing bugs with BUGSLIDE in the spray form, we recommend removing the bug residue in a timely manner; before they become cemented to the surface. Save money on the large 32 oz refill bottle. Refill your 16 oz or 4 oz travel bottles. No need to ever run out.